about their truly unforgettable marriage celebrations. Megan: We met through friends in the Big Apple Softball League after a game in which Sara’s team trounced mine. Sara was beautiful and hated that I smoked cigarettes, but still came outside to hang with me while I indulged in a bad habit, covering her nose and mouth with her softball jersey while we chatted. I was intrigued. Sara: She’s not wrong, I didn’t love the fact that she smoked. But she immediately caught my eye when I walked into Metropolitan with my teammates, and I knew I needed to get to know her. I’m so glad that I did, because it turns out she is so fascinating and generous and--this is critical--smarter than me. We started dating and I was mentally planning our wedding well before we ever talked about it. I wanted us to have a long, long life together, with her challenging me in all the best ways. We had our first conversation about what forever would look like for us as we walked down Riis beach in the summer of 2015. We both liked it enough that Megan quit smoking the next year, and we got engaged after several months of both of us dancing around the topic of rings. Megan just beat me to it! Megan: I proposed on New Year’s Eve just after midnight under a palm tree in Belize. There were fireworks. I had the flu. It was still perfect. And she’s being modest here. She’s the smart one. What were your priorities as you began planning your wedding? We set the goal of throwing a kickass party with great food, a hopping dance floor, and lots of love. We let the rest of our decisions flow from there. Having that agreement at the outset was a huge help in not taking each and every detail too seriously. We had both been to enough weddings to know which traditions felt meaningful for us and which we felt comfortable setting aside, so when it came time to make our first big choice, the venue, we went about as non-traditional as you can get. We knew we wanted to get married close to where we live in Brooklyn, and we both come from large families and have a large chosen family. The Bell House in Gowanus, where we’ve gone on countless dates over the years, was a natural choice (and it’s one of very few places in Brooklyn roomy enough to accommodate a party of 125 without breaking the bank). We told each other that even if everything else went wrong, we would have the perfect place to get married that screamed DANCE PARTY, and amazing food to soak up the open bar. There are always hitches, nothing ever comes together perfectly, but we started off on a great foot because we knew what we wanted the tone of our wedding to be. What surprised you most about your wedding- planning, celebration, and afterwards? Sara: I was surprised at how much I cared about things that I didn’t think were going to be important to me, and how quickly the time went by between getting engaged and the day. We were engaged on New Year’s and married less than nine months later. Which was a conscious choice we made, but I think both of us were a little naive about the effort it takes to plan an event like a wedding, even when you’re not going the traditional route. Megan: So much this. There are a ton of decisions to make, and it can be exhausting to continually check in with yourselves about what’s important to you. But it’s totally worth it. For example, I thought I wanted the traditional slow walk down the aisle, and we even auditioned a few songs at home. I was so surprised and thrilled when my bride suggested we scrap the Adele and go with some more upbeat Motown hits. It was so much more fun and more importantly -- it was us. Sara did this over and over again throughout the planning process, especially with the decorations. I wanted to buy a chuppah from Etsy; she insisted we go to Home Depot and she designed the damn thing by herself and we built it together! It was beautiful. 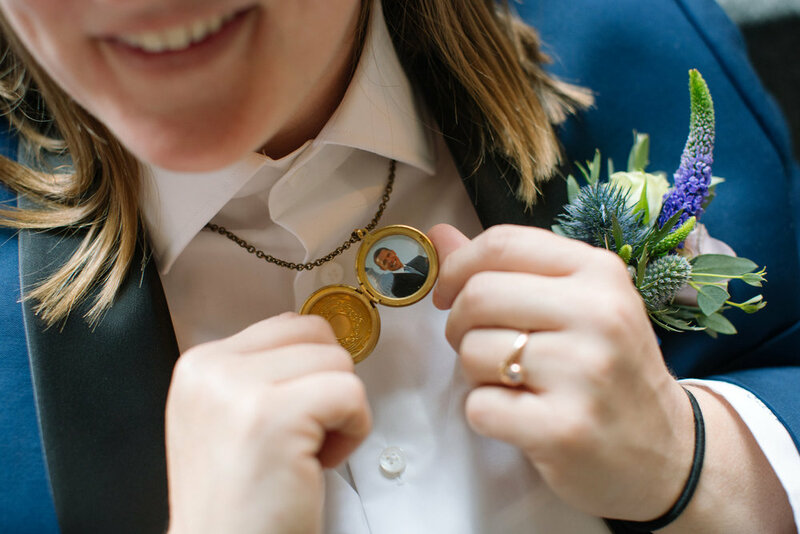 Sara: Having my hands on design details was important to me, but as much as I wanted to DIY a lot of the wedding, Megan also made sure to remind me that I didn’t have to DIY everything. She was a great emotional barometer for me during the planning when I insisted that I could make this or build that, reminding me not to take on more than I needed to, and pulling me back when I did. Surprisingly, I don’t think we ever fought during this process. We balanced each other out, complemented each other in ways that made everything pretty smooth, despite our short timeline. Megan: The ceremony itself had a few surprises too. 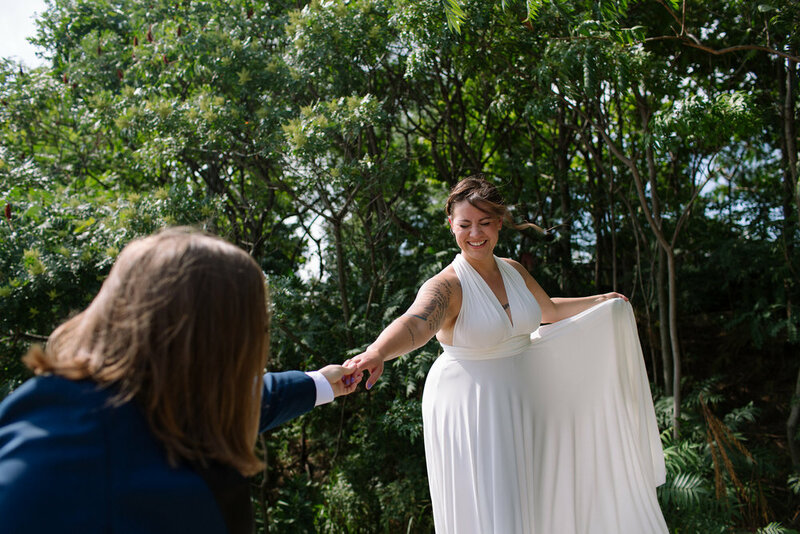 Our friend Victoria, a standup comedian, wedding officiant, and all around pal met with us a few times before the big day to map out a short, sweet, not terribly scripted or serious ceremony. We asked Victoria to make it lighthearted and fun, and boy did she deliver. For weeks after the ceremony people kept telling us they’d never laughed, cried, and laugh-cried so much at a wedding. It was exactly what we wanted. What was your favorite part of your wedding day and planning process? Megan: I had the hugest nerd crush on Sara when I saw what she’d done to keep us organized in Google sheets. Seriously. Sara: I looked at The Knot and Zola and a bunch of other wedding planning websites that just didn’t fit my style of organization. Plus, most of them were very much geared toward the traditional (read: heteronormative) style of wedding that we just weren’t going to plan, so I made it up as I went in a Google Sheet. I had a tab for EVERYTHING, it was all color coded, I had formulas. It was a thing of beauty. Megan: My other favorite part of the planning process was all the dancing we did in our kitchen while auditioning first dance songs. We built playlists in Spotify for that and other portions of the wedding like cocktails, dancing, and after party. Our AWESOME DJ, Tikka Masala, drew inspiration from these playlists and spun the best dance party I’ve ever been a part of. Sara: Tikka knocked it out of the g-d park. No Spotify playlist we could have ever come up with would have compared to how she was able to read our room and play the perfect song for each moment. My favorite moment of the day--aside from our vows, of course--was the big group portrait up on the stage near the end of the night. (Alexis’ Note: As their photographer, this was one of my favorite moments of the day, too. I loved helping to orchestrate it! More full community portraits on wedding days, please.) As the crowd was coming down, Tikka started playing Seasons of Love and I cried the biggest, happiest tears of my life. The music selection was so important to me, and that moment was so pure, unscripted, and joyous. Any advice for couples at the beginning of their planning process? Sara: Make decisions early about what is and is not important to you about your big day. You don’t have to follow the wedding planner that The Knot or Zola provide for you by default. Don’t feel pressured to follow all the conventions and trappings of the wedding industrial complex. Ask for recommendations from trusted friends who have gotten married in your area in the past. Take them to dinner and pick their brains, then ask to see the Google docs they made during planning. Don’t be afraid to ask them how much things cost, and about the things they ended up spending too much on. Megan: All of this and also: Ask every married person you know what they a. Loved about their wedding and b. Would have changed about their wedding. Not only will you learn a ton about your friends and family -- I had no idea my parents had 900 people at their wedding and no time to enjoy their party till I asked these questions -- you’ll also learn more about what’s important/not important to you on your big day. What will you always remember about your wedding day? Sara: I will remember running through that arch of bats for the rest of my life. (Alexis’ Note: Having met through softball, Sara + Megan decided to enter their reception with a surprise visual nod to the film A League of Their Own, and yes, the entrance was just as utterly wonderful + epic as it sounds!) The time and love that our team put into organizing that was so apparent, and having them there for us after they’ve been so present throughout our relationship was truly amazing. Looking back at the photos that Alexis took of the day, from getting ready at the 1 Hotel to Seasons of Love at the end of the night, I truly relive each moment as if it’s happening all over again. Remembering all the love and laughter from our day will not be hard because Alexis and Erika are such detailed documentarians. I’m unbelievably grateful to them both for capturing the pure joy we felt, that our guests felt, when celebrating our marriage, and to Alexis for being that person to go on this very intimate journey with us from the beginning. Megan: I will always remember the love in the room that night, all night. 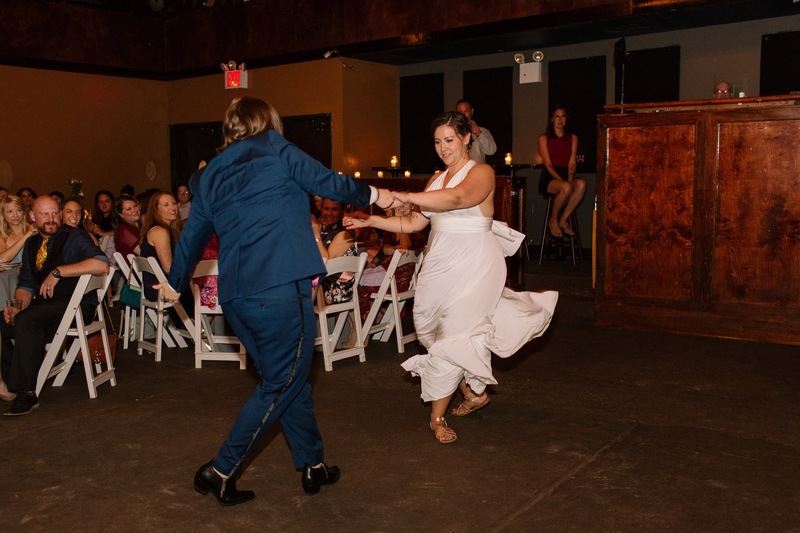 We walked into the Bell House before the ceremony and it was absolutely transformed from the usual comedy/music show setup into a stunning wedding venue (big thanks to our friends who set up the decorations, The Raging Skillet Caterers, the Wedding Wranglers, and the BH staff!) I can still feel in my heart the love that was pounding through applause and cheers when we entered the wedding reception. Unforgettable. Also: Sara was radiant in that wedding dress all day and night. Thank you for sharing your story, S + M!